To investigate the effect of a specified treatment course with CES on fibromyalgia (FM) patients’ sleep disturbance, pain, fatigue, and the impact of fibromyalgia on functional status when compared to sham treatment under the same experimental conditions in subjects meeting the inclusion and exclusion criteria. This was an IRB approved 8 week, randomized, sham controlled, double blind clinical trial. Subjects in the active CES and sham groups did a 60 minute treatment every day for 8 weeks. A third control group received usual care. Sleep disturbance is the variable of interest for this report. 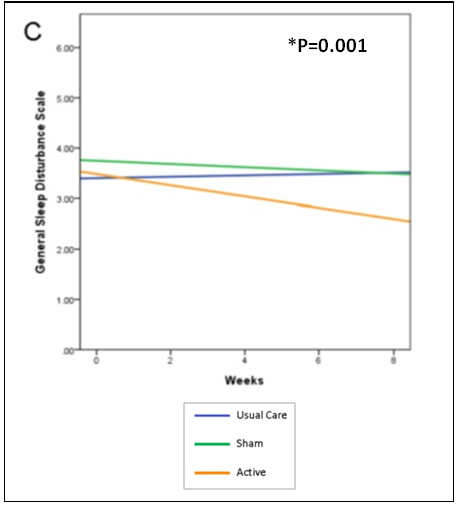 The primary effectiveness endpoint was the change from baseline in the last post-treatment scores on the outcomes measures for sleep disturbance, pain, fatigue and functional status compared to the sham treatment group at the endpoint of the 8 week study. • Male and female subjects with fibromyalgia ranging ≥ 21 years of age. • Diagnosis of fibromyalgia was verified using the criteria established by the American College of Rheumatology. • Reported an initial pain level equal to or greater than 3 on a 0 – 10 numeric rating scale (NRS). • Had stable medication use related to FM for at least 4 weeks. • Ability to read, write, and understand the English language. • Presence of implanted pacemaker, pump or stimulator device. Randomization assignment was established prior to the start of the study by the manufacturer of the Alpha-Stim device through the assignment of unique numbers (active or sham) to devices, Devices were assigned to subjects in the order listed on the device log.. Baseline measures were taken prior to start of treatment period and again at the endpoint of the study. No change was made in the medical management of the patient during the study. Participants in the active CES and sham groups were instructed to use the Alpha-Stim CES device for 60 continuous minutes each day for 8 weeks. Participants in the CES device group received devices that were active and preset at the factory to provide maximum of 60 minutes of modified square-wave biphasic stimulation at 0.5 Hz and 100 μA, the lowest setting that has been used in previous studies with patients with FM and below the level of perception. Participants in the sham device group received sham devices that were identical to the active device, but did not deliver any electrical stimulation. Device use was monitored by asking participants to document at what time and for how long the device was used each day. The General Sleep Disturbance scale was used to evaluate the incidence and nature of subjects’ sleep disturbances. The scale has established reliability and validity (Achterberg et al., 1981). The sample consisted “primarily of Caucasian females” who on average had a high school education or slightly above. Forty-six (46) subjects, 17 active CES, 14 Sham and 15 controls, completed the testing after the last treatment at the week 8 visit. There were no statistically significant differences at baseline between active, sham and control groups for any of the demographic or outcome variables. Data were analyzed using separate multilevel models to estimate mean differences among the 3 groups for each of the pain measures (NRS and SF-MPQ). Model parameters were estimated by restricted maximum likelihood, and the within-subject variance-covariance matrix modeled in the form determined by Akaike’s AIC criterion. Random coefficients regression models (for each outcome) were used to fit the data collected each week using weekly data points to estimate intercepts and slopes for each group. At Level 1 (within-subject analysis), the models essentially averaged each participant’s intercept and slope while accounting for serial correlation among measurements taken on the same participant. While all 3 groups reported scores that were in the insomnia range at baseline, the active CES group was the only group that reported decreased scores over the course of the study and completed the study with scores below the range of insomnia (p=0.001). Figure 1 shows the mean change over time in sleep disturbance symptoms among the active group, sham group and control group. the active group, sham group and control group for (sleep disturbance (p=0.001). Strengths of this study are: use of a randomized, sham controlled, double-blind design (The investigators chose to use the Alpha-Stim RCT research protocol for the study); active and sham Alpha-Stim devices were pre-set and locked at the designated levels for each specific group for current level and time by the manufacturer at the factory and sham devices were the same as active, except they did not emit electricity; randomization of devices was done by the manufacturer according to the protocol by the investigators; diagnosis of fibromyalgia was verified using the criteria established by the American College of Rheumatology before subjects could be in the study; and the structured and detailed protocol for the CES treatments for both active and sham groups.. The finding that CES significantly decreases sleep disturbances (insomnia) is consistent with other Alpha-Stim studies that found that CES significantly decreases insomnia. AGT, JGA, SLR, PAK, and CB, Center for the Study of Complementary and Alternative Therapies, University of Virginia, Charlottesville. JEL, Division of Clinical Rheumatology, Department of Medicine, University of Virginia, School of Medicine, Charlottesville, VA.